After the largely inconclusive if not in-significant elections in five provinces, attention is now focused on the South which is historically a volatile though important province. In 1971 and again in 1988, the south was the hotbed of the youth uprising led by the Janatha Vimukthi Peramuna - which today has emerged as a major third force and is expected to rise even higher through the southern elections. For the past three decades, the JVP has faced ups and downs, besides changes in its perception and image. From the bloody revolution of 1971, it moved back to mainstream politics again, only to go underground after being accused of inflaming the 1983 race riots. It came back to the spotlight with open rioting against the 1987 Indo-Lanka Accord, then came the 1988 - 89 era of terror which saw most of the frontline leaders being politically executed or exiled. Since 1994, the JVP has tried to project a new face and policy with a spokesman saying recently the party was open to change to fit in with global economic trends. The JVP's rise is causing concern both to the PA and the UNP. The PA government has orchestrated its southern campaign to attack the JVP more than the UNP. UNP leader Ranil Wickremesinghe, too, has taken serious note of the JVP's upsurge and cautioned working committee members that if the UNP was unable to devise and project a new image to attract the youth, it would face the fate that has befallen the old left. Sensing the threat or challenge from the new JVP, the PA is known to be going all-out to use anything and anyone against the JVP - including former strongman Rohana Wijeweera's widow, who is now under the protective custody of the government. It is reported that a powerful government official known to be close to the President met Chitranganee Wijeweera. As a result she is likely to issue a statement describing how her husband was brutally killed by the UNP regime, how much she suffered and how the PA regime saved and protected her. Though several ministers represent the southern province and a Southern Development Authority appointed some years ago, unemployment in the region is still high and economic development marginal. It was from the south that Chandrika Bandaranaike Kumaratunga in 1993 launched her campaign for national office but six years later she comes back to the south with little to show. Thus it is not surprising to see the PA using the old weeping widow tactics but whether the hard -pressed people and especially the youth would fall for it is another matter. The present political situation in the south was discussed at a high level meeting presided by President Kumaratunga. Among those present were Ministers Mahinda Rajapakse, Richard Pathirana, Amarasiri Dodangoda, Mangala Samaraweera and Deputy Minister Mahinda Wijesekera - all from the south. One of the items they discussed was the chief ministerial candidate with the President proposing Minister Rajapakse for the job. The ministers also agreed but not Mr. Rajapakse. He had felt that taking up the top post in the south might mean being sidelined from national politics at a time when he is known to have been at odds with the President on several matters. The President was apparently stunned when Mr. Rajapakse quoted a case from recent political history to explain what he feared. He spoke of how the Senanayakes and the Bandaranaikes had plotted to send Sir D. B. Jayatilleke out as a high commissioner, effectively preventing him from making a bid for the premiership. The President's second choice was Deputy Minister Mahinda Wijesekera, a former JVPer. But Minister Pathirana opposed that, saying it might have negative results, especially in the Galle district. After thinking again, the President then proposed Dallas Alahapperuma. 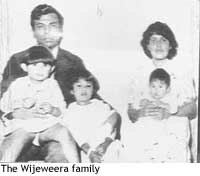 Mr. Rajapakse and Mr. Dodangoda were in favour of the Mulberry group leader but, Mr. Samaraweera and Mr. Wijesekera were against. They said that though Mr. Alahapperuma had got the highest number of preference votes in 1994, they felt he was not so popular now. After going round and round the President had little option but to settle for the outgoing Chief Minister Mahinda Yapa Abeywardena. The others agreed. Meanwhile, major changes are likely to be made in the ruling SLFP. According to these changes discussed at a central committee meeting, Ms. Kumaratunga will take over from her mother Sirima Bandaranaike as president of the party while Mangala Samaraweera is expected to replace the long-serving Dharmasiri Senanayake in the key post as general secretary. In another significant political move, President Kumaratunga on Thursday had what were described as cordial talks with MEP leader Dinesh Gunewardena. They discussed many matters with Mr. Gunewardena repeating his request that identity cards be made compulsory for voting at any election. He also asked the work of the all-party election monitoring committee be carried out. Mr. Gunewardena insisted that the MEP could not in any way align itself with the UNP, but he did not speak of supporting the PA, either. Political analysts said that the meeting was apparently intended to break the ice to enable both parties to have talks in the future. The President made no offer to the MEP while Mr. Gunewardena did not make any overtures to support the government to go ahead with the provincial administration. But it is likely that Mr. Gunewardena will further discuss these matters with Western Province Chief Minister Susil Premjayanth. If they agree on a common programme, it is likely that Bandula Gunawardena of the MEP would become the Chairman of the council, a post similar to the speaker of Parliament. In politics, they say, there are no permanent friends or enemies, only permanent interests. The President's meeting with Mr. Gunawardena appears to be a prelude to a bigger coalition for the presidential election. Meanwhile the PA has run into a major legal snag over the chief ministers it wanted to appoint in the North Central, Central, Uva and Sabaragamuwa provinces. These proposed nominees Ministers Bertie Premalal Dissanayake and Nandimithra Ekanayake, deputy ministers Samaraweera Weerawanni and Athauda Seneviratne had not contested the elections but the PA hoped to bring them in through the bonus seat procedure. They are now backing out amidst fears that they might lose both their Cabinet post and chief ministerial post if the UNP goes to court to challenge the procedure. To overcome these legal problems temporary chief ministers were sworn in and they may resign later to make way for the big names. The UNP is also looking for a powerful chief Ministerial candidate in the south with former minister M. S. Amarasiri being among those mentioned. Party leader Wickremesinghe had to contend with criticism in the aftermath of the provincial polls. But party chairman and successful candidate Karu Jayasuriya has been staunchly supportive of Mr. Wickremesinghe's view that it is only a narrow margin that separated the two main parties now. He expressed faith in the party leader's experience and political sagacity. On Thursday party leader Mr. Wickremesinghe held talks with Ronnie de Mel' Karu Jayasuriya and other on the Southern elections and then met UNP members newly elected PCs. But the second meeting produced fireworks and high drama with the rejected or dejected Rani Adikari taking centrestage. The wife of former Minister A. M. S. Adikari was angry that she was not appointed as the leader of the opposition in the NCP. She spoke at length on how much the Adikari family had done for the UNP and for Anuradhapura. Party leader Ranil Wickremesinghe was seen listening patiently until an exchange of words erupted between Ms. Adikari and the UNP's new organiser in the area, Themiya Hurulle. As the shouting continued Mr. Wickremesinghe told Ms. Adikari to sit and allow Mr. Hurulle to speak. Mr. Wickremesinghe sensing that Ms. Adikari was not prepared to take his advice then told her to stop speaking. "If you don't shut up, I will get the security to get you out," he warned. At this stage Mr. Adikari sensing that several security people were around her yelled at them. "If you touch me I will bite you," she screamed. The Ranil drama went on for sometime and finally Mr. Wickremesinghe decided to go to another room to have the discussion. Eventually Ms. Adikari came round and apologized. "I am sorry if I have offended you," she said. Though some of her earlier remarks had infuriated Mr. Wickremesinghe. A few days ago, Mr. Adikari too was summoned by the UNP leadership and insiders say he was asked to step down from the apex body' the working committee. The Adikaris are accusing Charitha Ratwatte of orchestrating the UNP leadership against them. Mr. Adikari known to be backed by general secretary Gamini Atukorale has described . Mr. Ratwatte as an upstart podian' apparently referring to the time when Mr. Adikari was a minister and Mr. Ratwatte his secretary. The surprise setback for the UNP in the Uva was also discussed with one candidate describing how a blunder during the campaign has driven both the Tamils and the Sinhalese from the UNP. The first blow was when the popular chief ministerial candidate died during the campaign. The second blow came when the UNP appointed a Tamil in his place while saying he was only a group leader. This devaluation of the Tamil candidate, it was claimed, angered Tamil votes while many Sinhala voters feared that a Tamil would be appointed as chief minister. Thus the party lost votes on both sides. The UNP is facing problems in Kandy also. Chief Ministerial candidate Keheliya Rambukwelle and Cader Hajiar who had been arrested over an alleged political murder have expressed dismay that no top UNPers were present in court when their case was taken up recently. The only consolation for them was that former strongman Sirisena Cooray visited them in Bogambara. Amidst these and other controversies, the UNP parliamentary group met last Monday after the Avurudu recess. Mr. Wickremesinghe taking up various matters said the government was using the new NGOs Act to accommodate its cronies in the NGOs. He said that the UNP should move for a three hour adjournment debate on it. This is likely to be held next month. Member R. A. D. Sirisena spotlighted the crisis of falling tea prices and taking remedial measures. He said the UNP should ask for a debate on this too. Thereafter, Mr. Wickremesinghe and Kalutara District MP Mahinda Samarasinghe gave details of the faux pas where the government was humiliated in an international battle between the PA and the UNP for the seat of the Asia-Pacific representative in the human rights committee of the Brussels-based Inter-Parliamentary Union. The post which involves responsibility for monitoring human rights in the region was won by Mr. Samarasinghe by a thumping 130 to 11 over government nominee deputy minister Anura Priyadarshana Yapa. The battle now moves from Brussels to parliament with the UNP deciding to move a motion of no-confidence on Speaker K. B. Ratnayake on the allegations that he acted partially in supporting Mr. Yapa for the IPU post. Mr. Samarasinghe said it was essentially a non-political job but the government moved to politicise it and ended up with mud on its face. He said according to convention a country nominates only one member and he had been nominated first but the government for some reason moved to nominate Mr. Yapa and campaigned hard for him. An MP had quipped that the PA campaigns so furiously that he thought they could have sent a man from Anamaduwa to Brussels for the job. He said though the government had officially nominated Mr. Yapa, the delegates overwhelmingly chose him to give a massive snub to the PA.
Former Speaker M. H. Mohamed, MP Mano Wijeratne and Mr. Wickremesinghe were among those who strongly criticised the role of Speaker Ratnayake in the Brussels battle.